Eighteen years ago the non-profit Hungry for Music was founded by local entrepreneur Jeff Campbell – a man inspired by a vision to heal the world through music. The idea germinated back in 1992 while Campbell was taking a fund-raising certification program at George Washington University where he came up with the idea to organize a concert to benefit the homeless by asking street musicians to donate their talents. GW’s Lisner Auditorium became the setting for two concerts to benefit DC’s Coalition for the Homeless and led to many area food drives. By the time of its founding two years later, the organization had redirected its mission. Campbell explains, “In 1994 I wanted to do something with kids and music. I’d met a photographer who was putting cameras in the hands of kids to give back and that was what it did it for me. I realized how powerful music was for kids.” He started with kids that wanted to play but had no access to musical instruments – kids in blighted neighborhoods, kids in schools with no music programs, needy kids whose families barely had enough money to put food on the table. Across America funding has dried up for school cultural programs and entire music departments have shut down. But Campbell looks to revive the performing arts for kids who have little hope and few creative outlets – – one musical instrument at a time. As expected the organization takes in monetary donations, but others give new or used musical instruments – horns that were neglected in favor of soccer, guitars outgrown and pianos gathering dust. Four times a year Campbell drives around the country in a van loaded to the gills with instruments promised to dozens of kids. He visits with grateful teachers and students from the Appalachian Mountains and out to the Midwest of Chicago and Milwaukee, then on down to the New Orleans’ Gulf Coast where they enthusiastically await his arrival. “It’s very therapeutic for me,” he admits. The rest of the year is dedicated to shipping instruments to needy kids. Each spring, in tribute to Campbell’s Louisiana roots and New Orleans supporters, Hungry for Music hosts a zydeco-fueled Crawfish Boil in Alexandria (Read my coverage of that event here – http://whiskandquill.com/?p=1951). Summer brings the wildly popular, Cof-a-Que weekend fundraiser; a three-day BBQ competition and all-day-and-night music bash set on a Loudoun County farm beside a picturesque lake. In May 2013 Campbell will be in the Woodstock, NY area to host yet another benefit concert. Throughout the year Campbell sells CDs compiled from songs donated by some of the country’s leading musicians like Bob Dylan, Bruce Springsteen, Paul Simon and others. The legendary bluegrass pioneer Hazel Dickens performed for one of their benefits shortly before she passed away. The organization’s reach has expanded both nationally and overseas, helping children in places as far-flung as El Salvador. In Galax, Virginia, home to the country’s renowned Old Fiddler’s Convention, Campbell takes stringed instruments to the Junior Appalachian Musicians (JAM) a youth group founded by musician and elementary school counselor Helen White. Her initial program has grown to encompass 22 programs in three states and now serves more than 900 kids. 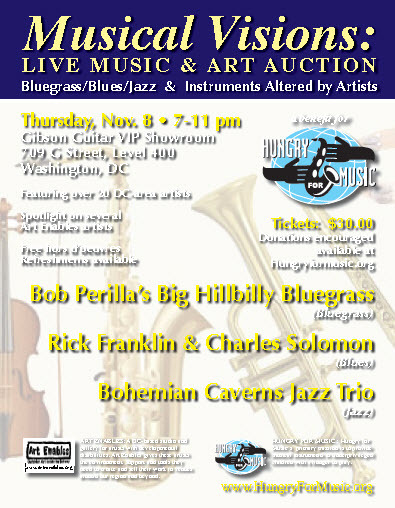 On November 8th, Bluegrass, Blues and Jazz will converge at the Gibson Guitar VIP Showroom across from the National Portrait Gallery for the Hungry for Music Musical Visions: Live Music and Art Auction. The event will feature food and drink with live performances by local musicians. “Over 20 DC-based artists have transformed old donated violins, clarinets, flutes and guitars into art and photography for the silent auction. It’s a really cool performance space with guitars all over the walls,” Campbell says. For more info on this event visit www.hungryformusic.com.